Home Kids Room Decor Fun Kids Themed Rooms Camo Bedroom Decor Check out the local Army surplus store first! Check out the local Army surplus store first! While it’s easy to just buy all that new decor from someplace like Amazon you should check out the used gear at an Army surplus store first. A used helmet will look wicked on a shelf. Fill some army boots with concrete & make some killer bookends! Even a Beat Up Old Footlocker for a toy box would be cool. A worn flag gets a new life on your kids wall…or get some new ones, they are dirt cheap! Army or US Flag. And lets face it what kid wouldn’t want a decommissioned bomb on their wall? 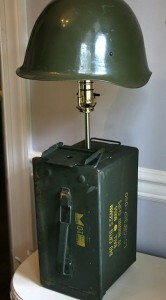 Or get creative & make an army helmet & ammo box lamp…you know you want one! Basically go buy some old beat up Army junk & give it a new life. The kids will have a blast making their own room accessories. Time to Fix Up the Camo Themed Windows!